I'm forever perusing all the beauty sections of every site to see what new skincare products are popping up. Here are the ones that caught my eye these past few weeks. 1. Murad Oil-Control Mask - Anything to keep me matte in the summer is on my radar. I actually have this mask and love using it 1-2x/week in the morning. 2. Clinique Pep-Start Hydroblur Moisturizer - Blur? Hydrating? Yes to all of these. 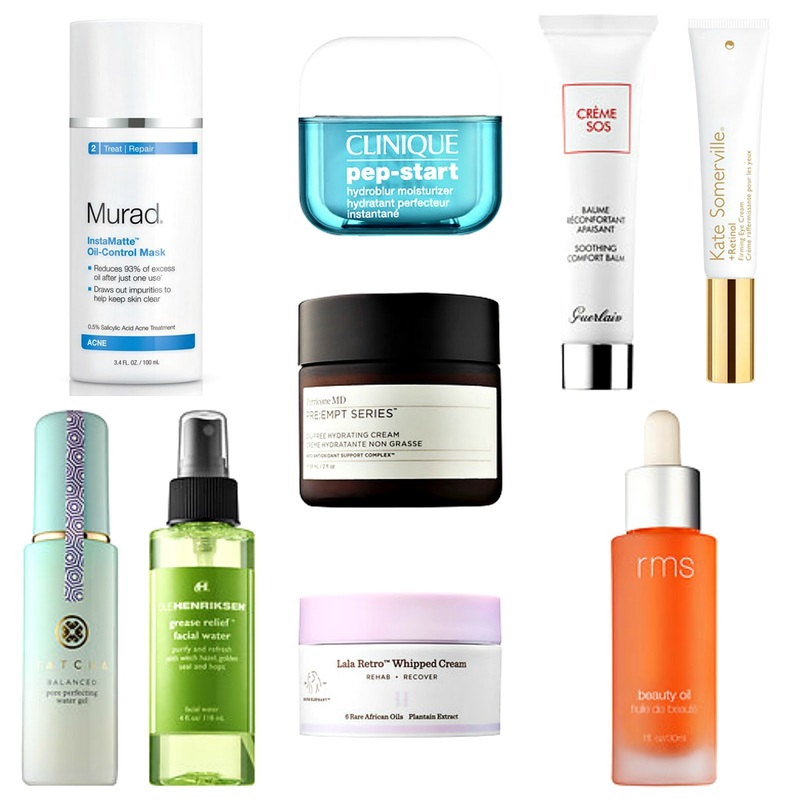 I am already a huge Clinique skincare lover (this cleansing balm and this classic hydrating moisturizer), so I am always intrigued to try their new launches. 3. Guerlain Soothing Comfort Balm - It's always great to have a product in a skincare routine that is designed to comfort and soothe the skin because irritations are inevitable. This new one from Guerlain seems like something I would want to keep in my cabinet for those instances. 4. Kate Somerville Retinol Firming Eye Cream - I love a retinol product for the face (swear by this oil, this cream and this serum), but there are only a few retinol formulas for the eyes available. This may be a great option for those looking to help address any fine lines and firming for the eye area. 5. Perricone MD Oil-Free Hydrating Cream - I have already been through an entire jar of this moisturizer from Perricone, so this oil-free hydrating cream sounds like something right up my alley. 6. Tatcha Balanced Pore Perfecting Water Gel - This just arrived in the mail so I will be testing it out this weekend. I have heard nothing but wonderful things about this water gel especially for those with oily skin. Stay tuned! 7. Ole Henriksen Grease Relief Facial Water - Grease relief? As an oily skinned gal, that is music to my ears. Not sure how a spray delivers those kinds of results but I am still interested to try it. I'm a sucker for skincare! 8. Drunk Elephant Lala Retro Whipped Cream - I am already a huge fan of Drunk Elephant (yay to this serum), and this whipped cream sounds like hydration heaven. Perhaps it conjures up ideas of desserts in my head - either way I think it sounds decadent and wonderful. 9. RMS Beauty Oil - RMS beauty has been on my radar for quite some time - both makeup and skincare. This beauty oil sounds simple and basic, but sometimes those products are the most effective.